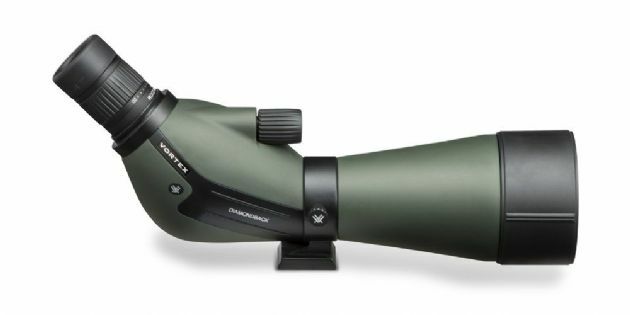 Born into the bloodline of the popular Vortex Diamondback family, the all-new Vortex Diamondback 80mm spotting scope delivers outstanding performance - clearly a superb choice when you need a heavyweight performer in a light, compact package. The Vortex Diamondback optics guarantee a bright image throughout the magnification range. Dielectric Prism Coatings - Multi-layer coatings provide the clearest, brightest, most colour-accurate images possible. Porro Prism - Offers maximum image quality and performance in a traditional design. Angled Body Design - Valued for allowing an overall lower mounting height which maximizes stability in wind, offers greater comfort when viewing for extended periods, and permits the use of a smaller, lighter tripod. Waterproof - Optics are sealed with O-rings to prevent moisture, dust, and debris from getting inside the spotting scope. Fogproof - Nitrogen gas purging delivers fogproof and waterproof performance. Adjustable Eyecup - Twists up and down to provide comfortable viewing with or without spectacles. Sunshade - Reduces glare and shields the objective lens from raindrops and snow. Rotating Tripod Ring - Allows rotation of the eyepiece to a sideways position—most useful for viewing through an angled spotting scope body on a car window mount.